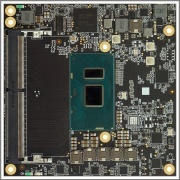 COMEX-IC60U is a COM Express Computer-on-Module built around Intel Core 7th Generation processor family. COMEX-IC60U is fully compliant with the COM Express standard and has been designed for seamless integration into COM Express system designs. From time to time CompuLab releases new software versions for COMEX-IC60U in order to fix bugs, address component changes and add functionality. It is highly recommended to subscribe to the COMEX-IC60U RSS Feed in order to receive automatic notifications about software updates. This page was last edited on 5 July 2018, at 13:18.